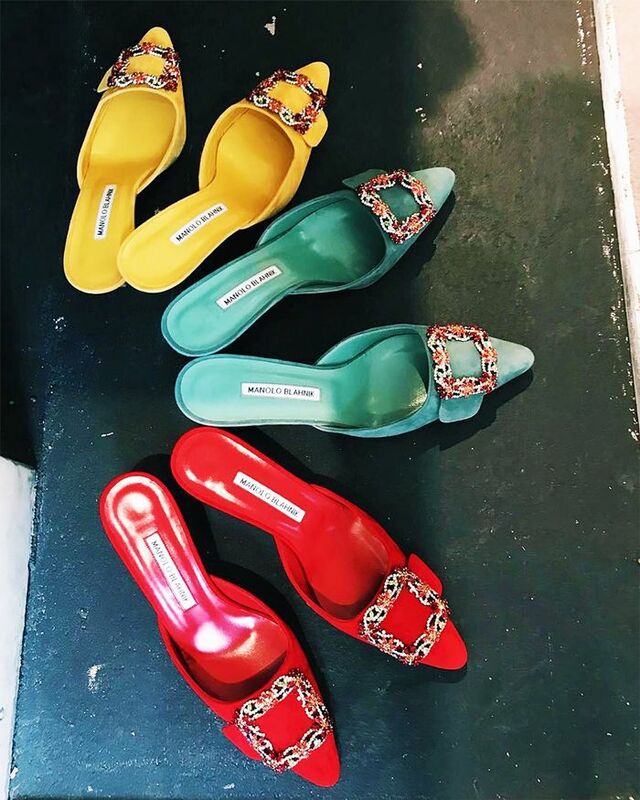 Mr Blahnik's shoes have always been at the top of the fashion tree, but a few years ago, I wrote about a very noticeable, Instagram-driven resurgence for the iconic jewel-encrusted Hangisi courts and mules. A new generation of girls has discovered the beautiful craftsmanship and the of-the-moment stiletto silhouettes this maestro is famous for. Once again, the wheels are set backwards for a comeback to end all comebacks. Since that point, the Spanish shoemaker's creations have (praise the fashion gods) been slightly easier to get hold of thanks to an increase in online stockists. The kudos of Manolo—a man whose heels are adored in both real fashion circles (Anna Wintour) and fictional ones (Carrie Bradshaw)—has been appreciated in even more exclusive circles thanks to ingenious collaborations with Rihanna and Vetements. And now it's the turn of another signature design to take to the spotlight: the Maysale. First introduced 27 years ago and relaunched last spring/summer, the Maysale has once again become the most popular kitten heel on the block. Pernille Teisbaek and Shini Park were some of the first to wear the buckle-fronted five-centimetre stiletto mule, establishing a more modern, casual approach to the '90s cult classic via their use of denim, shirting and simple midi dresses. Many hawk-eyed girls followed suit, not to mention other brands and retailers producing imitations. Fast-forward a year, and the appeal is nowhere near fading for the rebooted original. Accessories gurus Anna Vitiello and Florrie Thomas of And Finally agree, captioning an Instagram post of traffic light–coloured versions: "The Maysale are making a comeback (and they're even better than ever)." "We introduced the Manolo Maysale for A/W 17, and it was an instant hit with our customers—it was online and in store for less than one day before it sold out!" Ida Petersson, womenswear buying director for Browns Fashion tells me. "Since then, we've placed several reorders and added new colours to our edit, which have performed extremely well—the red suede was the star of S/S 18. Our customers seem to have fallen in love with this style, and they just keep coming back for more. Part of its appeal is the chic silhouette; it elongates the leg, but it's the heel height that really makes it. Mules are not always the easiest to walk in, but this kitten heel ensures that you can walk for hours without suffering from those toe cramps that most mule lovers will know and dread," says Petersson. Considering many of our shopping justification comes from staying power and strong cost-per-wear, we can't think of a better pair of shoes to invest in than those that are still just as relevant and well-made almost 30 years after they were first created. Keep scrolling to shop these hot shoes for yourself. So cool with raw-hem jeans. Vibrant and very good for wedding guest outfits. Technically bridal, but we won't tell if you don't. Shoes are the best, aren't they? See all of spring's best shoe trends next.